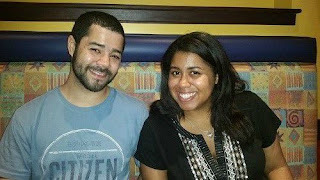 Tinsel & Tine Philly Film & Food Blog: In the Spotlight: East Coast Wings & Grill - Win a Gift Certificate! 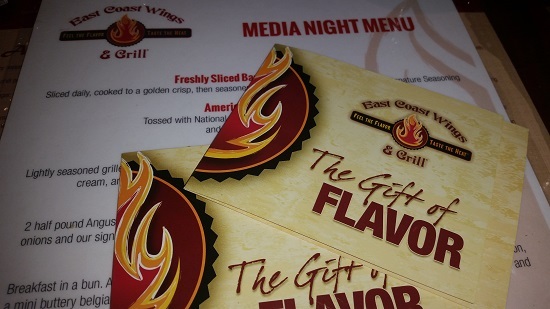 In the Spotlight: East Coast Wings & Grill - Win a Gift Certificate! Got invited to another fun, blogger eating fest last week, this time at EAST COAST WINGS & GRILL which recently opened in the North East - 2539 Castor Ave. Philadelphia, PA 19134. As the name suggests, East Coast Wings caters to chicken wing lovers offering 75 WING FLAVORS - everything from traditional wings to Bacon Ranch, Kick'n Thai, Grand Caymen, Harvest Apple and soooo many more! 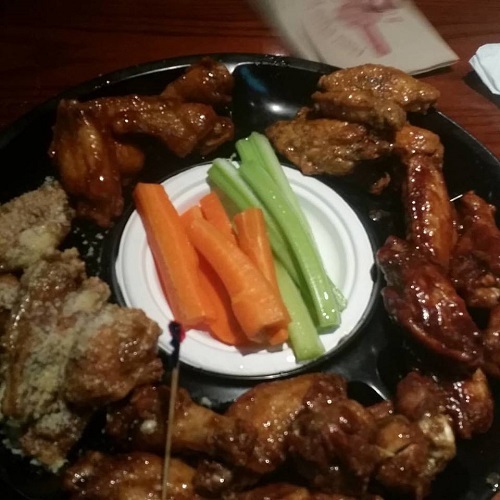 You can do a ECW Wing Flight (Choose from 30 boneless or traditional with a maximum of 5 flavors) for $27.99. With all those wing flavors, believe it or not, Honey BBQ is their most popular, so our ECW Wing Flight didn't consist of flavors, instead we were served the Honey BBQ, but in 9 degrees of HEAT! 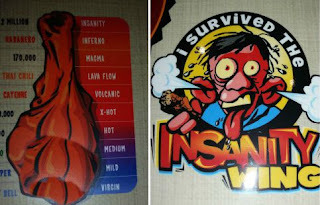 ECW has devised a thermometer of spicy, starting with less than mild called "Virgin"; then up the scale to "X-Hot", which most of us found to be pretty tame; the "Volcanic" is what most would consider your typical very hot, hot wing, but then the next level, "Lava Flow" is CRAZY HOT!!! Which makes sense, as a volcano is hot, but not dangerous unless you're being thrown into it - it's the lava that will kill ya! The last degree is "Insanity" this is their challenge wing level. Prizes are given to the soul who can handle this kind of fire. One of the servers said it's basically pepper spray and that when he tried it, he nearly passed out, and that no matter what you do, it tends to lingers on your mouth and tongue for a full 24hours. ECW also features some awesomely crazy burgers, we had a "Big Daddy Patty Melt" which is a bacon cheese burger stacked between two grilled cheese sandwiches. What I loved most about this burger was the Ghost Pepper Cheese, this is going to be the new chipotle, mark my words, every restaurant and fast food chain will soon be creating ghost pepper cheese this and ghost pepper cheese that. but have you ever had one with a waffle stuck inside? 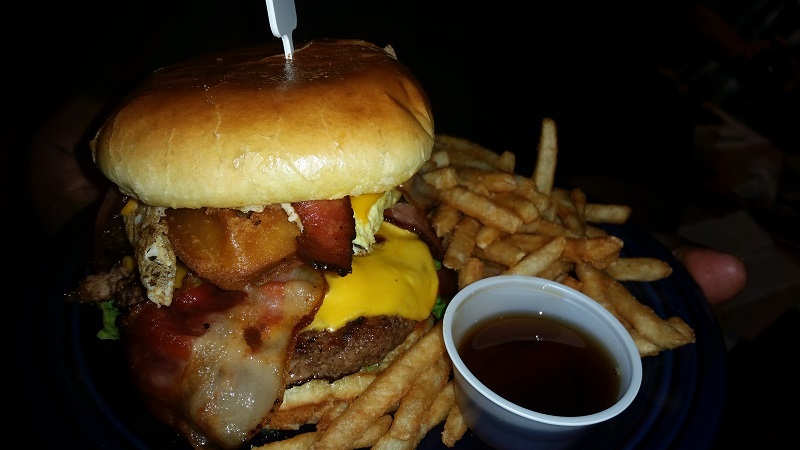 Plus, instead of ketchup you pour maple syrup all over it! 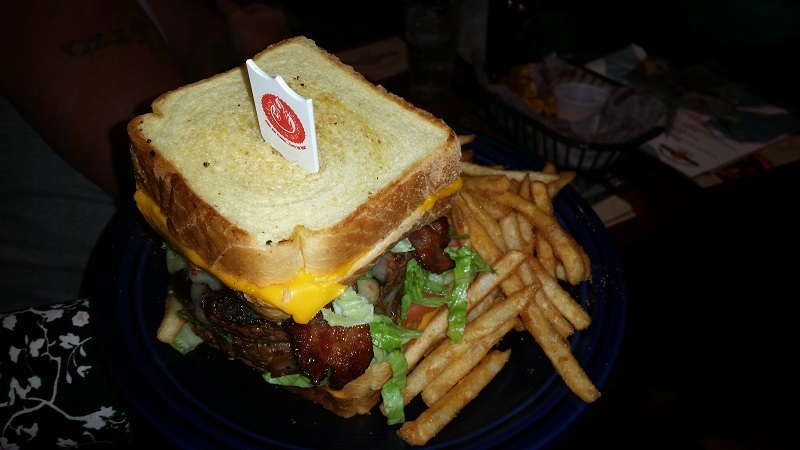 Let me be clear, the waffle is not the bun substitute, it's kinda hard to see from my picture, but it goes: bun, bacon, cheese, egg, waffle, bacon, cheese, burger, bun, with a side of fries. As dangerous a combination as this is, I really want to come back for another one in October when these two burgers are officially on the menu. 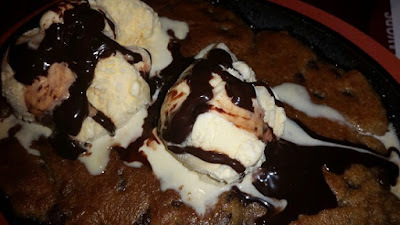 For Dessert a Chocolate Chip Cookie Skillet a la mode - Need I say more? Shout out to my dinner companions Al Dia News Media, photographer/content mgr, Samantha Madera and her wing eating friend (pictured), also finally met Marilyn from Philly Grub, we follow each other on social media, and Jill Laster of Bucks Country Fun Family Events. Hope to see you all at the next stuffing! Got a chance to go back and have more wing flavors! Click HERE for post.